For some time Joan Sanger had been concerned about people in the villages of Beckingham and Saundby who might be feeling lonely or isolated and after taking early retirement from Teaching in December 1991, she decided to do something about it. A meeting was held in Joans house with a few like-minded people, among them were Jane Whitfield and Myra Neall and also Mrs Bower from Age Concern, to discuss the situation. It was decided that they should have a go. A meeting was arranged for 11th September 1992, in the Recreation Room, for which leaflets were distributed around both villages, inviting all age groups to come with their ideas and suggestions to discuss them over a cup of coffee. Over twenty people attended, armed with lots of interest and encouragement. As a result it was decided to hold regular fortnightly meetings on Fridays from 1.30 to 3.30pm, at 25p per session with a raffle, in the Recreation Room, following the Luncheon Club, to enable people to stay on after the meal and join the group. Thus the Friendship Group began and leaflets were distributed around the villages inviting everyone to the first Meeting on Friday 25th September 1992. 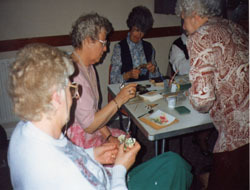 A set up grant of £200 was applied for and received from The Village Elders Fund. This fund existed to develop new projects and services of benefit to the community (promoted by Age Concern Nottinghamshire and Nottinghamshire Community Council). Two years later, the Chairman of Bassetlaw District Council Councillor Ian Atkinson, made a donation of £500 to the Group, which helped to further craft activities, related speakers, demonstrators and visits. 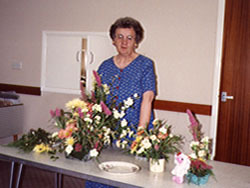 Miss Marjorie Clayworth was the first demonstrator, in 1992, with her Flower arranging and she still demonstrates today. On making contact with the Village School the junior children came to show the Group their Assembly, which they had presented to their parents earlier in the day, staying on afterwards to chat with members. They returned on another occasion to interview members as part of their village project. The Group Members were invited to the dress rehearsal of their Christmas Play and were also invited for lunch at the school on a number of occasions. The Members thoroughly enjoyed all the visits to school and the contact with the children. Doris Bell, eventually became leader of the Friendship Group, shortly after which, the meeting place moved from the Recreation Room to the Methodist Church Hall. Doris led the Group for 12 years organising visits, speakers, dinners and many activities, which were enjoyed by everyone. In 2002 the Group nominated her, through the Bassetlaw District Council Golden Jubilee Scheme for all her hard work and dedication to the Community for which she was presented with an award. In 2006 Doris decided it was time to take a back seat and she retired from the leadership of the Group. In the same year the Group returned to the Recreation Room for their meetings and formed a committee to share the workload. Those elected were, Kath Long as Chairperson, Hazel Richardson as Secretary, June Barley as Treasurer and Peggy Davison as Committee Member. In 2018 after 12 years of running the Friendship Group Kath Long decided to retire as Chairperson. During that time the Group has raised over £12,000 for many different charities, an amazing amount! Kath has given so much of her time to the organising and arranging of meetings, trips, speakers and fundraising and her commitment and dedication has been next to none. She will be much missed and is wished all the very best. As the future of the Group was uncertain and no-one seemed willing to take over it was decided that their bank account be closed and the remaining funds divided between Bassetlaw Hospice and Five Villagers First Responders, with the cheques being presented at their final meeting on Friday 2nd February.The Group may continue in some other form yet to be decided.